Megaprojects—Large, complex projects in petroleum, minerals, chemicals, and power fail much too often for comfort. Large cost overruns, major delays, poor operability, and far too many safety incidents characterize well over half of the industrial projects of $1 billion or more around the world. In this book, Ed Merrow, the founder of Independent Project Analysis (IPA), explores the reasons behind the failures and comes to a very useful, if surprising, conclusion: the damage is largely self-inflicted. That is profoundly good news because what we do, we can fix! 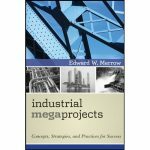 Merrow finds that the path to megaprojects failure is usually laid out early in a projects development of the basic business strategy and timetable for the project. The failure to align the stakeholders effectively and develop the basic technical data package sufficiently leads to major disappointment. The standard project development process Front-End Loading must be augmented with an effective asset shaping process to yield successful results. IPA presents a step-by-step approach to asset shaping in the book. Industrial Megaprojects helps companies, business professionals and project leaders and staff take control of their projects early on before problems start and carries the projects right through completion. The book is loaded with data to help you convince others and with lots of examples (masked to protect the guilty) to make the subject come alive. As we head into the second decade of the Century we can look forward to more very large and complex projects than ever before. Industrial Megaprojects will help you tilt the odds of success in your favor. IPAs Megaprojects Database contains over 300 megaprojects representing an average cost of $2.6 billion in 2010 terms, with an average authorization year of 2004. Approximately 100 different owner companies are represented. Nearly 70 percent of the projects are joint ventures. Most projects are greenfield investments; a few are major expansions to an existing plant or field. These megaprojects represent oil and gas developments, petroleum refineries (grassroots and modernizations), chemical complexes, LNG, and minerals development. The megaprojects in the database were executed in locations around the world: North America, the Middle East, Europe, Asia, West Africa, South America, and Australia.